The kids and I found these in Parents Magazine a few years ago and I just found them in my Thanksgiving box. Since we have so many wine corks I thought it would be a great use of wine corks!! I have a hurricane vase on my bar and just pop them in there for activities just like this. We are also hosting Thanksgiving this year which gave us another motivation to make these. 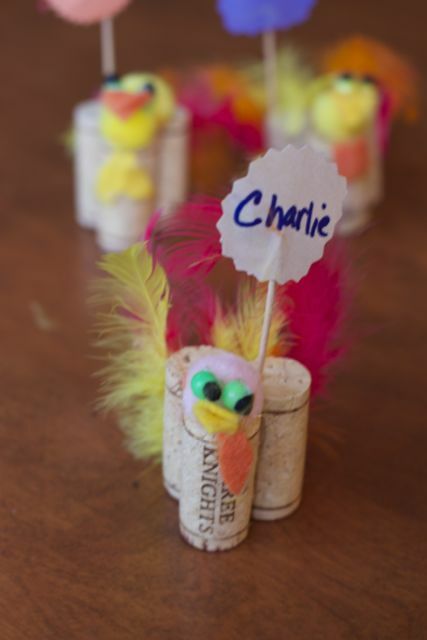 We adapted our turkeys slightly mainly because of supplies we had on hand. You could also make a similar version with a large pinecone. First we glued the three corks together in a triangle shape with a glue gun. 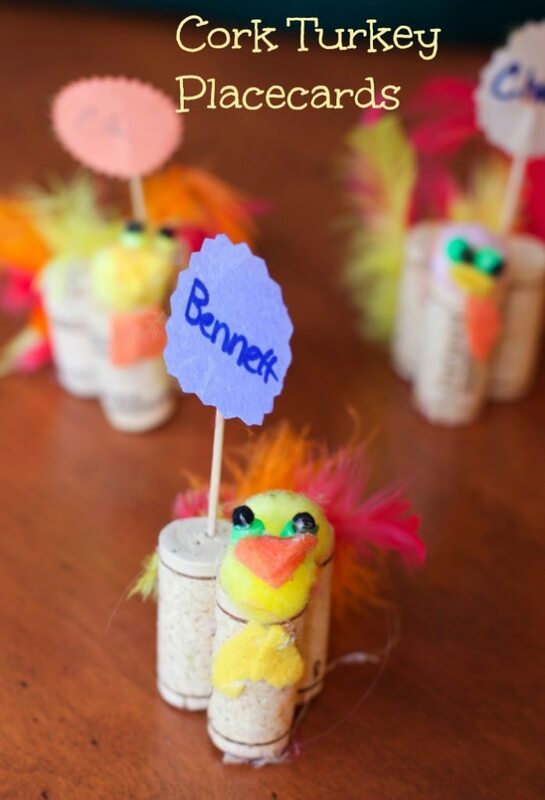 Then add the feathers on the side with two corks. Place a pom pom (perferably larger than shown) onto the top of the featherless cork. FOr the eyes add the tiny black pom pom into the whole of the bead. Then glue them onto the pom pom. Cut out a diamond shape out of the yellow felt, fold it in half, I glued it shut and glue to face. Cut out the waddle with red or orange felt and glue under the head. For the place cards we just used fancy edge scissors to cut paper but if you have a large decorative punch you would look more professional. Write the name on the circle and tape to a toothpick. Just push them into the cork. Fun and reusable year after year. Do you make special Thanksgiving Place cards? Check out our edible place cards too.